Coming to the Outer Banks during the off-season can be just as fun as coming during the warmer months and we encourage it. The past few years, the North Carolina Coast has seen a change when it comes to the “chillier” times of the year or off-season. 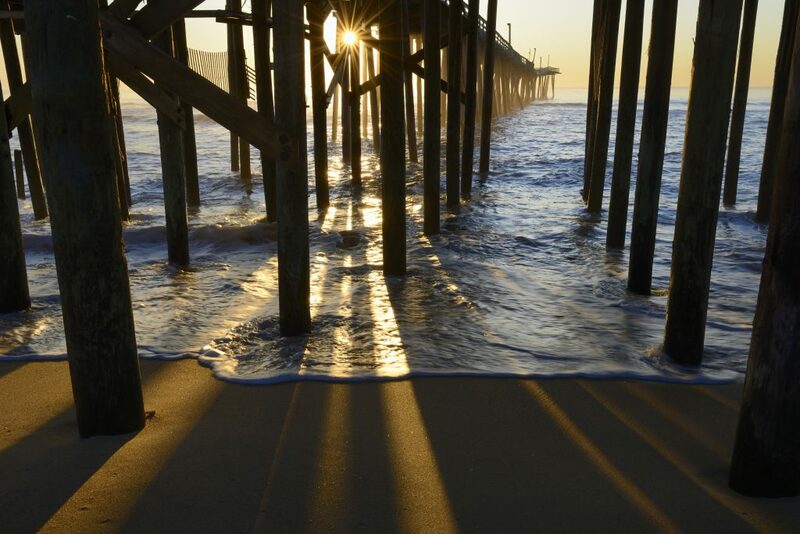 Normally the summer season on the Outer Banks is where visitors can enjoy the warm sunny salt air and the sandy beaches. Now that winter has made its appearance, you can still enjoy the beaches but with cooler air. 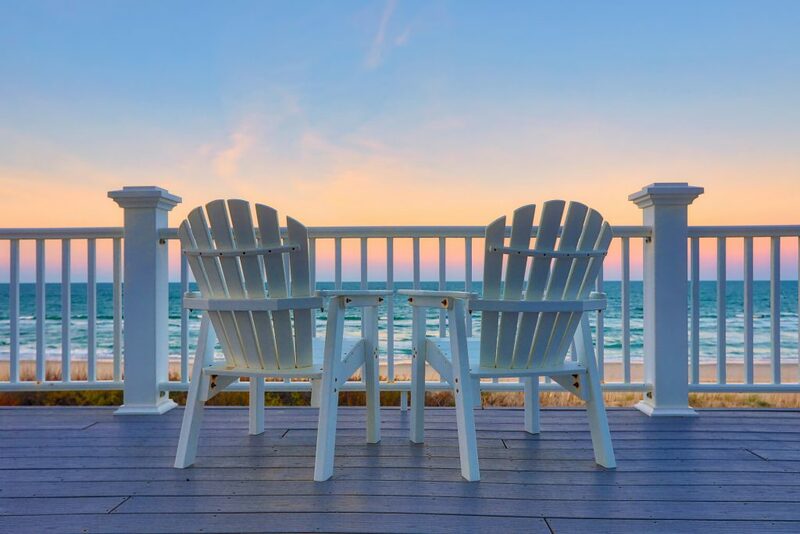 Staying in one of our beautiful Outer Banks vacation rentals will help keep you and your family close to where the wintertime fun happens to be on the North Carolina Coast. 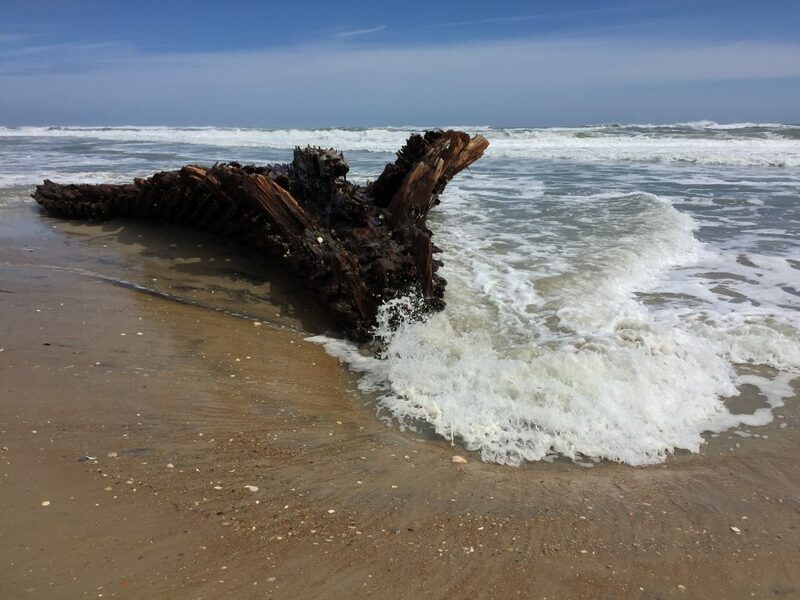 The Outer Banks is known to be the “Graveyard of the Atlantic” because of all the shipwrecks found along its coast. The barrier islands have a wealth of history to them and getting to learn more about the 3000 shipwrecks can be pretty neat. 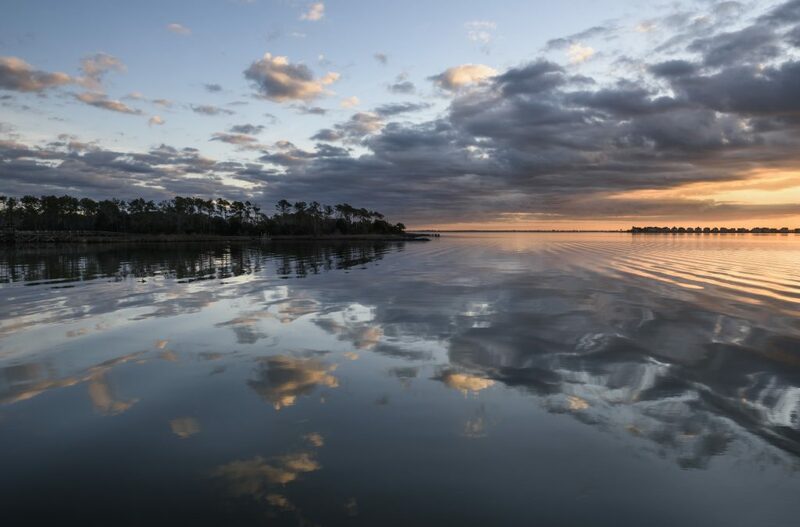 Head over to the NC Maritime Museum that has plenty of exhibits dedicated to its grave namesake and learn why the North Carolina Coast have been known to be some of the most dangerous for seafaring. Plus, there are a few places on the shore where you can go see some of these shipwrecks. Coming to the Outer Banks during the winter can have its advantages. You and your family can look for shells which normally during the summer may be hard to find with it being so crowded. Before you head on vacation to the Outer Banks, be sure to pick up a mesh seashell bag for your day on the beach. This bag will allow you to collect the seashells without having to bring back with you all of the sand. Once you are back in your vacation rental, have a mason jar for each family member and add your collected shells into it. This way you can take home your shells but without the added mess that they may bring with the sand. This can be a fun and exciting souvenir you can take home after every trip! Coming to the beach isn’t the only thing that you can do on the Outer Banks. 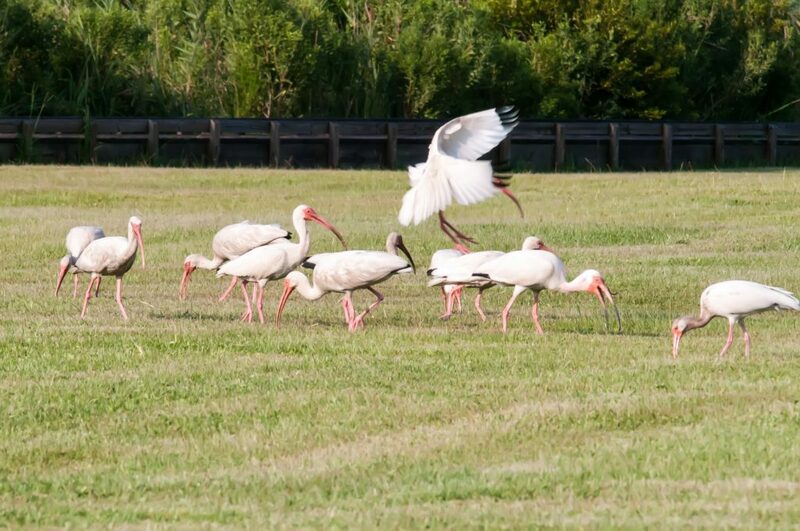 Head on over to Pea Island National Wildlife Refuge which is where you and your family can enjoy some wildlife. Open 7 days a week you can spend all day at the park if you’d like. They do offer 90-minute guided walk if you’d like to learn about the nearly 400 species of birds who call the Outer Banks their home. If you and your family would like to wander on your own, then take advantage of the 13-mile-long sanctuary. But keep an eye out for a few endangered species such as the Red World or the Loggerhead Sea Turtle. While on vacation, you have to visit one of the lighthouses on the Outer Banks. If you’d like to see all of the lighthouses in a day here’s how we suggest you do it. 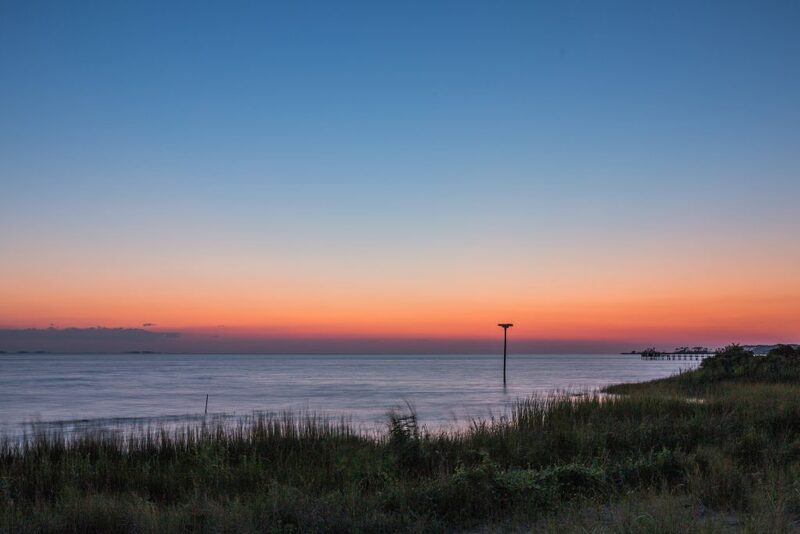 Begin your trip out, start by visiting the northern area of the Outer Banks by visiting the Currituck Beach Lighthouse. 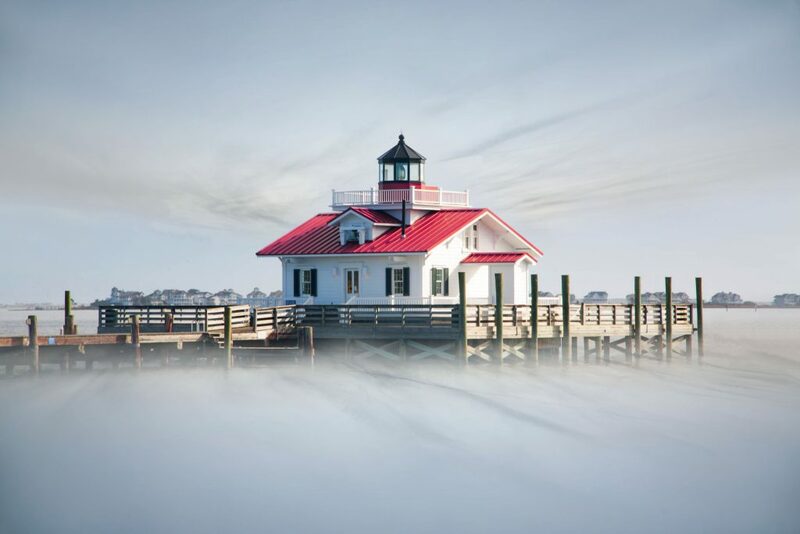 Next visit the Bodie Island Lighthouse in Nags Head followed by the Roanoke Marshes Lighthouse on Roanoke Island. The Cape Hatteras Lighthouse would be next, and finally visit the Ocracoke Lighthouse. The ones you can climb are Currituck Beach Lighthouse, Cape Hatteras and Bodie Island Lighthouse. The others you can visit but climbing is not open at the time. What a great way to spend the day learning about these amazing lighthouses on the coast of North Carolina! With so many fun things to do during the wintertime on the Outer Banks, these we thought you’d enjoy. And when staying in one of our Outer Banks vacation rentals, you will be near it all. We hope that you and your family have a wonderful Christmas and Happy New Year! Now that school is back in session, it only means one thing for those who love to visit the Outer Banks. Fall fishing on the Outer Banks is one of the best things that you can do when you vacation here. The weather begins to get cooler later in the month of September, there are less people and the fishing is great! And when you stay in one of our Outer Banks vacation rentals, then you will be close enough to where you can go fishing. Did you know that the best time of the year for the angler is during the fall months? 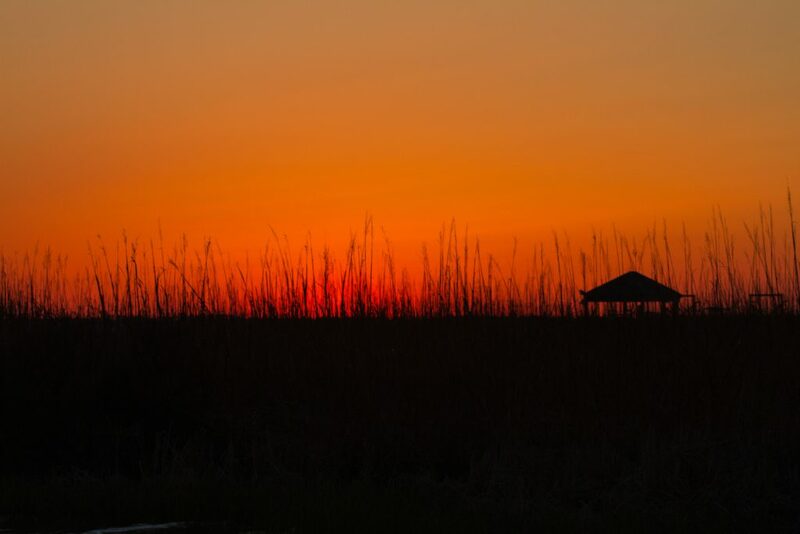 Let’s look at where you can find some of the best fishing on the OBX this year. When you think about fishing, many like to consider fishing from the beach. This doesn’t require much equipment which is normally a rod and a reel. But if you want to bring a little more to enjoy yourself on the beach. 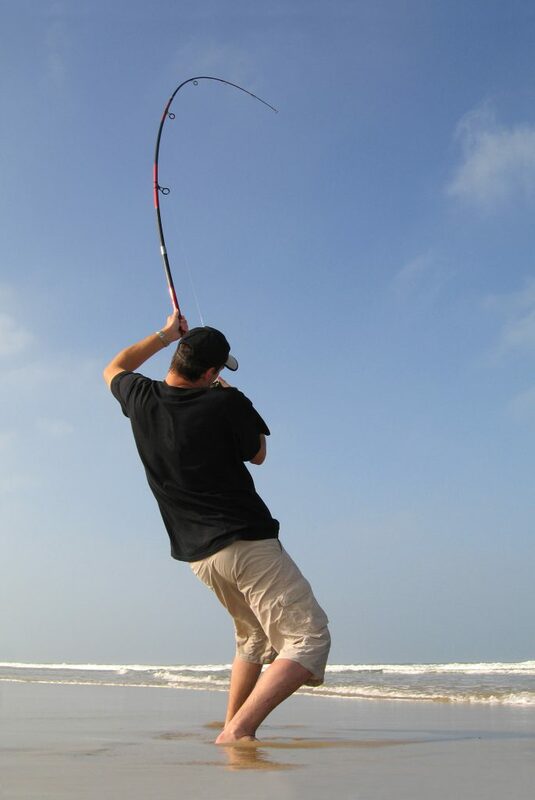 The size of the rod we recommend would be at least an 8 or 9-foot rod to be able to fish from the surf. Having different weights and lengths will help as well to help you with getting your line to stay in the surf and not float away. If you bring with you a sand pipe that will help you keep your rod and reel from getting ruined. It’s just a piece of PVC pipe that you will stick in the ground and super cheap too. 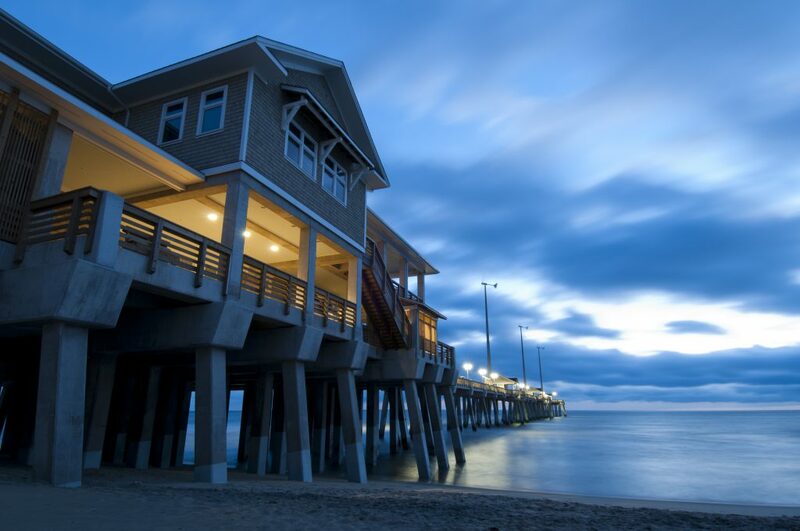 If surf fishing isn’t for you but you still want to experience fall fishing, then head on over to Jennette’s Pier in Nags Head for the day. There you will be able to fish for the day for $14 per adult and $7 per child. You can also rent a rod for $10 which can be very beneficial to those who don’t want to bring their own rods. But if you are staying in the area for longer than 2 days and want to fish the entire length of your trip, you can. You can purchase a 3 day or seven-day pass to be able to fish longer than the first few days. You will be able to purchase bait and other items in the tackle shop while you fish. One thing that you might have to get is an NC Fishing License which is pretty easy to get. You can either go to the NC Wildlife Site to obtain one or when you go fishing on the pier you are able to obtain one there too. The price for Coastal Recreational Fishing is a 10 day for $5 for Residents of North Carolina. If you happen to be a non-North Carolina Resident then the cost is $10. If you are still looking for an Outer Banks vacation rental, check out the specials we have right now. 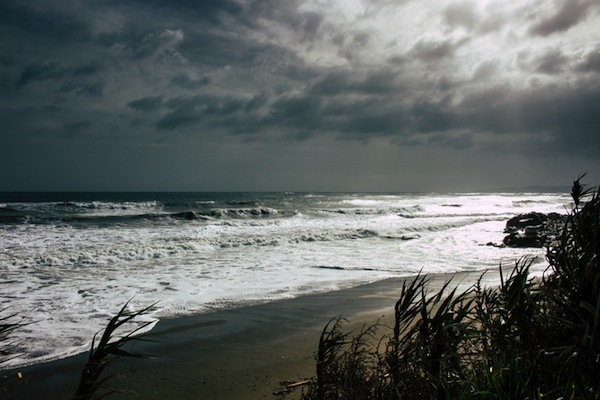 When people come to the Outer Banks for vacation, they think of only the surf, sand and sun. There are many other things for you to do and see. 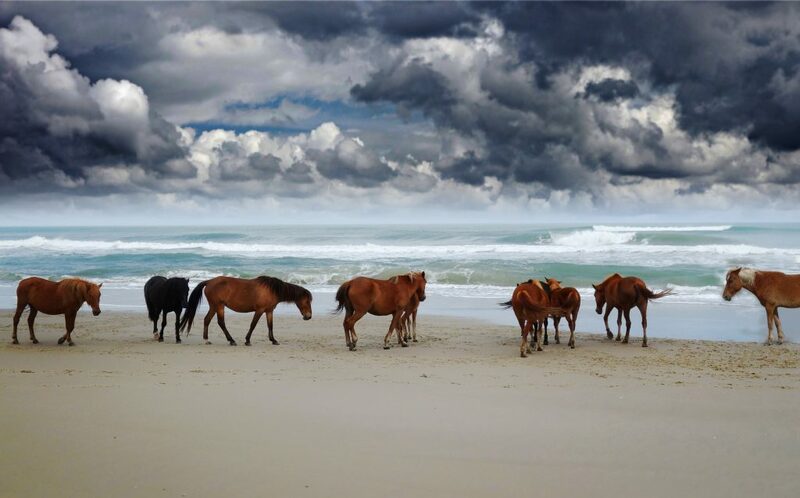 One of the things that is a must do and see would be the Outer Banks wild horses and the last mule of Corolla. And don’t be surprised if you are staying in your oceanfront vacation rental if you happen to spy Raymond or one of the other OBX wild horses. They wanted to come by for a quick hello. Last winter, it was believed that the last living mule was dying and many thought that they would never see him again. Raymond, the mule was originally thought to have passed away during the winter months but he didn’t and proved he is just too stubborn to go. Meg Puckett, the herd manager of Corolla Wild Horse Fund, thought Raymond had passed away after a last effort to save him in November. They had to drug him to be able to saw down his hooves which had become so deformed it was difficult to walk. Many of the locals who know of Raymond took to social media to celebrate his return to the rest of the Outer Banks wild horses. The wild colonial mustangs are believed to have been brought to the Outer Banks more than 400 years ago. The mules came later when the farmers worked the barrier islands and their livestock got loose among the wild mustangs. While the farmers are now long gone and with Raymond being the only remaining mule of the bunch, it will be a sad time for all who are familiar with him when he passes away. It will feel like a little piece of history has died along with Raymond. 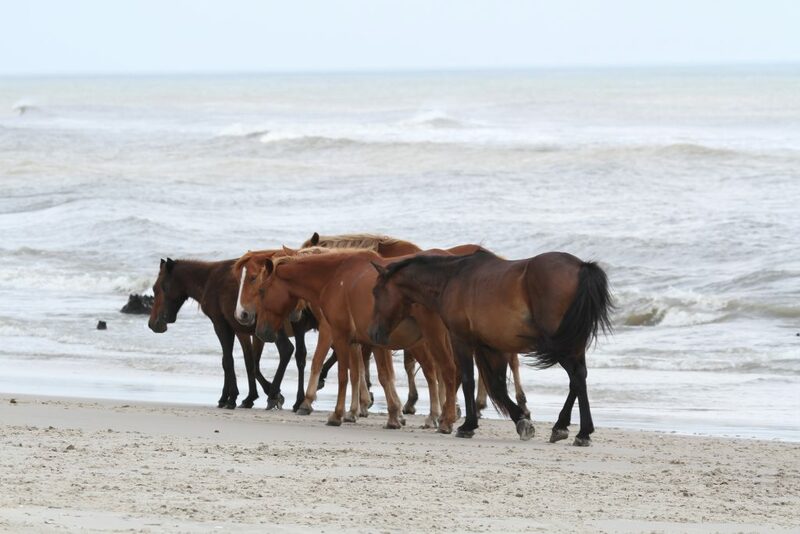 The Outer Banks wild horses roam freely in Corolla and most are going to be found in the 4-wheel drive areas of the beach. While it is illegal to come within 50 feet of the horses, you can still admire their beauty from a safe distance. Please note that you cannot pet or feed these wild horses as they are not like domestic horses. And in 2010 the Spanish Mustang was designated as North Carolina’s official state horse. What an amazing accomplishment for keeping the history of these horses alive. 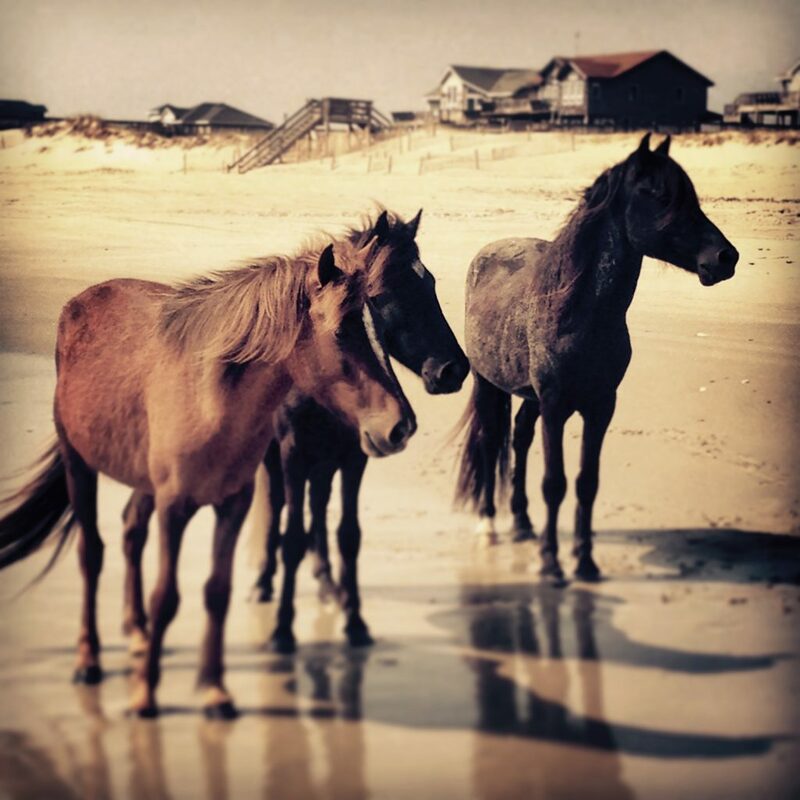 If you’d like a little help seeking out these beautiful animals, there are many tours available to see the Outer Banks wild horses in the Corolla area! If you are still looking to take a family vacation this year, then please look at one of our Outer Banks vacation rentals. We’d love for you to come visit our beautiful area, and to see the beautiful wild horses and Raymond the mule. Don’t miss seeing Raymond before he is gone forever! 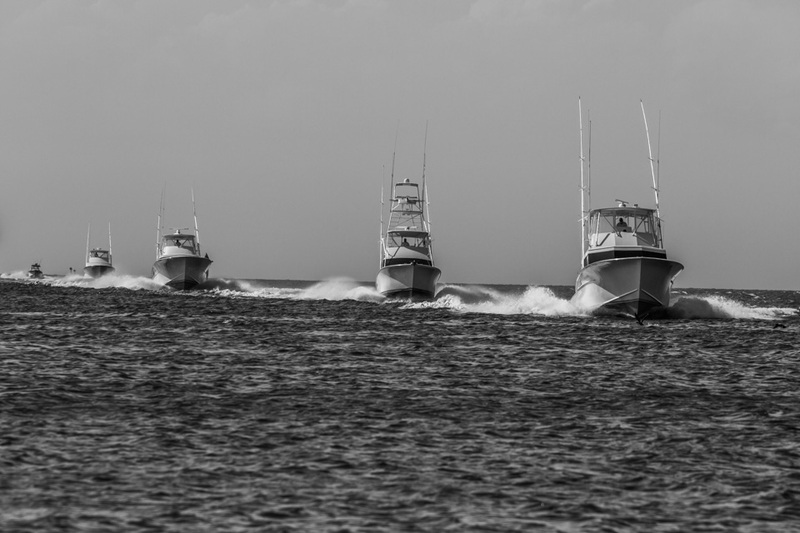 The 24th anniversary of the popular Hatteras Village Offshore Open is once again the Kick-Off Tournament in the prestigious North Carolina Governor’s Cup Series. The event was inspired and organized by the Hatteras Charter fleet. Each year the Hatteras Village Civic Association hosts participants from all over the east coast in the quest for Hatteras’ big blue marlin. The rules are very simple. The Island is very welcoming. And the fish are out there. This is your chance to make a difference. Entry forms and fees can be mailed ahead of time. On site registration starts at 5 p.m. on May15 at the Hatteras Village Civic Center. All boats fishing the tournament must be registered by 8 p.m. on May15. Fishing days are any three out of the four days from Wednesday, May 16 through Saturday, May 19, 2018. The non-fishing day must be reported to one of the official reporting stations listed below prior to 8 a.m. of the day declared a non-fishing day. All marlin released must be reported on a release form the same day as the fish is released. Release forms must be turned in at the Official Weigh Station at Hatteras Harbor Marina by 6:30 p.m. each day except for the last day when they must be in by 6 p.m.
Cash prizes and plaques will be awarded for 1st, 2nd and 3rd place in Level 1, and cash prizes for Level 2 which are billfish levels. Cash prizes will be awarded to 1st and 2nd place in Level 3. Level 4 is winner take all and a plaque for the largest blue marlin landed as specified in the rules. Cash prizes will be awarded for the largest tuna, dolphin and wahoo weighed in daily in Level 5. Cash prizes will be awarded for the greatest number of daily billfish release points in Level 6. The Hatteras Village Civic Association will retain 15% of the entry fees. Lay Day forms must be turned in to and of these marinas by 8 a.m. of the day declared a non-fishing day. Lay Day forms will not be accepted at the Civic Center. We all hope for perfect weather when we plan a beach vacation but sometimes Mother Nature has other plans for us. If you find it raining during your vacation don’t fret. There are still plenty of things to do to occupy your time. Up and down the coastline of the Outer Banks there’s always something entertaining and even educational going on. 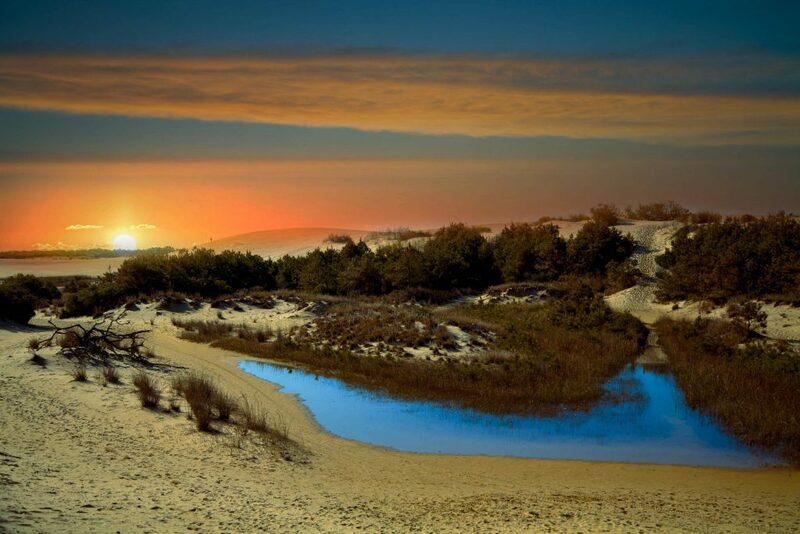 Below are a sampling of what you can enjoy in the various parts of the Outer Banks. TimBuck II is a shopping center located in Corolla North Carolina. It features 60 different shops, restaurants and recreation. Time travel to the past through Miss Kitty’s Old Time Photos in Corolla. With backdrops, accessories and costumes for the Old South, Wild West, Pirates, Civil War, American Indians, Roaring Twenties, Victorian-era and more, you can be transformed into a fantasy figure and leave with an original photo. An Aveda Concept Salon and Spa that has been creating beauty and cutting edge style since 1996. Eden Day Spa and Salon uses an array of Aveda products that soothe and treat hair and skin. Three Locations one in Corolla, Duck and Currituck North Carolina. This family owned business specializes in styling hair with braids with or without beads, hair wraps, and even henna tattoos. All a perfect beach souvenir. Some of the styles include custom Henna/Jagua tattoos in brown or black, full color temporary tattoos, braiding & cornrows, and even feather extensions. Beach Braids has three locations – Corolla, Duck and Nags Head. The Town of Duck has the well-known reputation as one of the best vacation spots on the Outer Banks. Duck has appeared on a number of national best beach lists including Travel Channel’s Best Beach Directory. With a mix of independent businesses and the Duck Town Park and Boardwalk, Duck Village is a perfect rainy day destination. Aqua Restaurant offers fresh regional cuisine and various cultivated wines. The casual dining in an elegant waterfront setting. 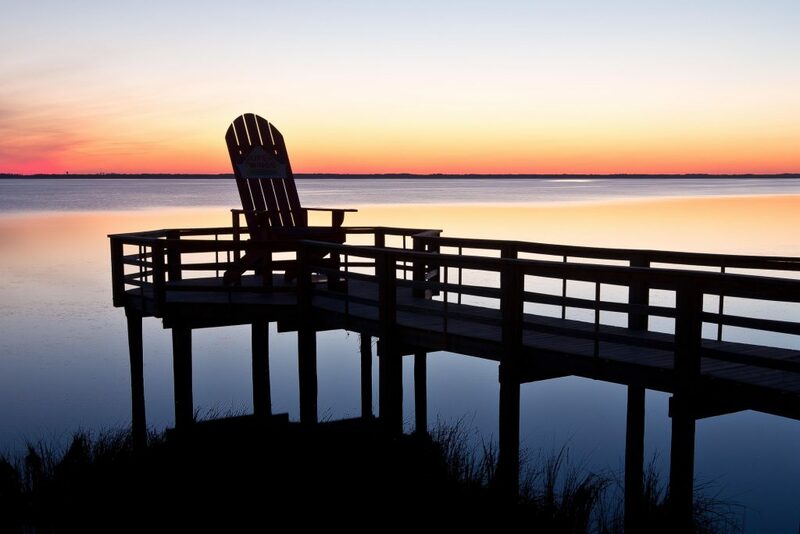 Overlooking tranquil waters on the sound front, this is where you’ll find complete peace while on the Outer Banks. The expert attendants use the highest quality organic products to renew and relax you during the treatments while fulfilling your individual needs. This collection of cool clothing boutiques, restaurants and shops vary from home décor to pet pampering. Stay dry while browsing from store to store under the covered porches that connects the shops. SeaDragon Gallery in Duck has a collection of traditional and contemporary handcrafts and fine arts. The gallery is filled with jewelry and works in pottery, glass, metal and wood by local Outer Banks, North Carolina artists and artisans from across the United States. Located in The Waterfront Shops in Duck along the Currituck Sound. If the weather is being a little difficult take advantage of this time to pamper yourself. At integration Massage & Bodywork Therapy is available daily in the Kitty Hawk and Nags Head massage studios, as well as mobile massage offered in the comfort of your home or rental cottage. For a wonderful evening of fun and laughter, don’t miss The Comedy Club of the Outer Banks. The comedy shows are frequently listed as “OBX top 10 Things To Do this Week” for evening entertainment. This is the Outer Banks only indoor, black light 3-D mini golf and is a great place for family fun indoor activities. Live action laser tag, enclosed bound house play area, and over 60 arcade games, everyone is sure to have a good time. Jennette’s Pier is a state-of-the-art educational center and fishing pier complete with a pier shop, classroom and banquet hall. There are various unique educational programs perfect for indoor experiences. A perfect place for full entertainment when it’s raining in paradise. The OBX Bowling Center is the only bowling alley on the Outer Banks. The center has 24 lanes of automatic bumpers, a snack bar/café, a pool hall, and a bar and large game room. On Friday, Saturday and Sunday bowlers can party from 10 p.m. until 1 a.m. at the Neon Rock ‘n’ Roll party. The Gallery Row Arts District is a unique area in the heart of Nags Head North Carolina, a coastal community surrounded by the beauty of the Outer Banks Cape Hatteras National Seashore. The district was designed by the Town of Nags Head to showcase its fine art galleries, dinning, unique shops, and other cultural heritage ties. Galley Row is located north of Bonnett Street and in between S. Virginia Dare Trail & Rt 158 Bypass. The first “legal” distillery on the Outer Banks of North Carolina. Located in historic downtown Manteo. The site offers Kill Devil Rum tastings and tour on site. Kill Devil Rum by the bottle is available at the distillery, local OBX restaurants and ABC stores for purchase. Distillery tours are available Tuesday – Saturday. Must be 21 years or older. Something different to try on a rainy day is Bianca’s Tarot Cards & Horoscope Readings. Bianca is genuinely able to offer a wide variety of insightful service such as traditional psychic readings, tarot readings, and fend shui. All Readings are private and confidential. A non-profit organization dedicated to encouraging the arts in Dare County through advocacy, enrichment and opportunity. Art in every medium and style is offered at the local arts council gallery in downtown Manteo. The arts council has exhibitions that change monthly in the gallery and open every first Friday of the month. Usually two artists are featured. The 68,000 square-foot complex covers all aspects of aquatic life under the surface of the ocean and sound waters bordering the Outer Banks. The aquarium is one of three in the state located along the coastline that were opened to promote appreciation and conversation of North Carolina’s aquatic environments. Perhaps we can offer a little encouragement to join us on the Outer Banks this year with a montage that our friends at Swell Productions filmed for the website. It’s getting so nice so early this year it seems like spring is already here. Although we may have a little more cool weather to deal with ahead, it’s these little glimpses of warmth that bring back those memories of summers past. There’s something magical in the changing of the seasons, a connection between us and the promise of new experiences. Lately, as the sun has lingered longer and longer each evening, and the unseasonably warm days have driven us to enjoy the outdoors, it’s been almost profound how much spring can lead to not only a renewal of life around us, but within us. We hope you take time to enjoy the premature blooming of ornamental trees, the warmth of a borrowed spring breeze, and feel a sense of renewed spirit to remember those times you went to the edges of the earth to explore and truly live. If you’re inspired let us know. Even more importantly plan your own adventure to the OBX this year. All of us at Outer Banks Rentals would love to help with a great rental home to begin with. Browse our best vacation homes and plan your escape to the edge. 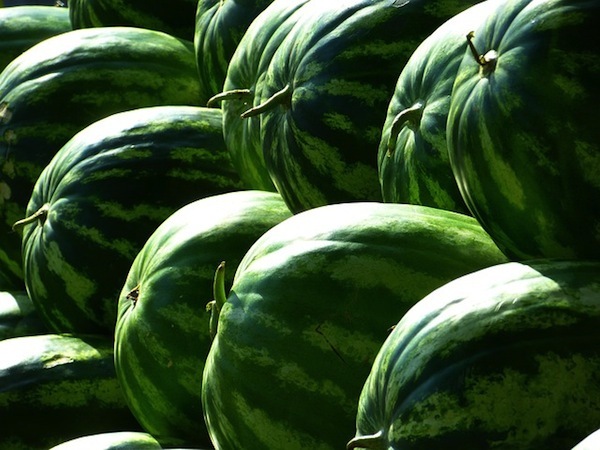 Celebrate summer on the Outer Banks with Kitty Hawk Kites and support theOuter Banks Bicycle & Pedestrian Safety Coalition at the 11th Annual OBX Watermelon Festival on Thursday, August 3 from 10:00 a.m. – 4:00 p.m. at Jockey’s Ridge Crossing in Nags Head. The festival is free to attend but tickets must be purchased to participate in the games and activities. All proceeds from this event will benefit the Outer Banks Bicycle & Pedestrian Safety Coalition. The day will include games, food, face painting, tie-dye shirt making, arts and crafts activities, an inflatable waterslide, lots of watermelon fun and plenty more. Compete in classic competitions like seed-spitting and watermelon-eating to win awesome prizes including various Kitty Hawk Kites adventures, swag from Dunkin’ Donuts OBX, a hammock from Kitty Hawk Hammocks, and more. 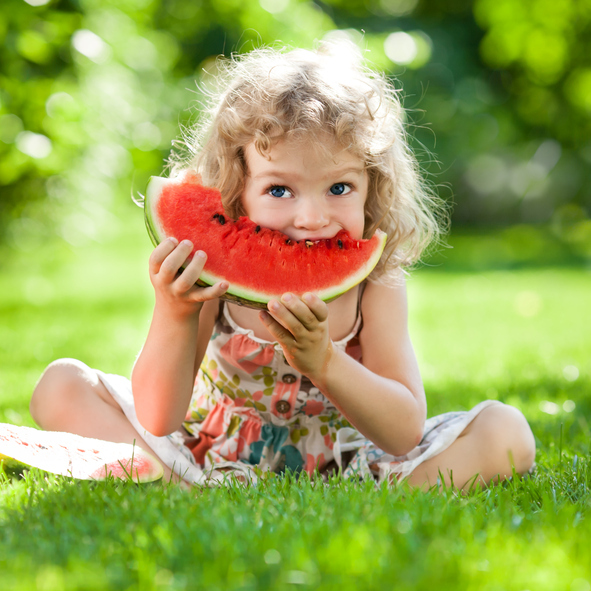 Stop by and share in this summertime tradition with watermelon provided by Food Lion. Lunch will be provided by Mulligan’s Raw Bar and Grille and frozen treats from Scoop’s Homemade Ice Cream. The highly entertaining, unique and fun-filled Soundside Live Sunset Concert Series begins on May 25, 2017. If you’re vacationing with us and looking for something to do, this is it. 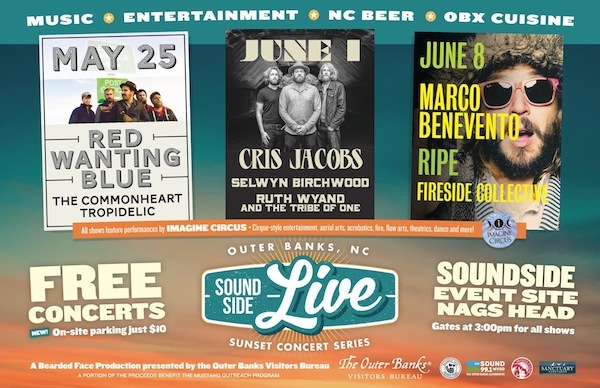 Sponsored by the Outer Banks Visitors Bureau, all shows are held at the Soundside Event Site in Nags Head. Additional summer concerts are held on June 1 and June 8, 2017. A curated line-up of regional and national touring talent will perform an eclectic mix of rock and roll, blues, soul, funk and bluegrass. Each show also features performances by Imagine Circus, a cirque-style entertainment troop with aerial arts, acrobatics, fire, flow arts, theatrics, dance and plenty more. Admission is free, $10 for onsite parking and gates open at 3 p.m.
Products from beverage partners Mother Earth Brewing of Kinston, NC and Sanctuary Vineyards of Currituck, NC, will be for sale as well as local cuisine from some of Dare County’s finest restaurants. In addition, a few Outer Bank’s artisan vendors will be onsite selling their handmade goods.